Deep purple in color with an abundance of fruit on the nose. Subtle flavors with plum being the most prominent and a hint of pepper and alcohol on the finish. Pairs with BBQ, pizza, and pasta. 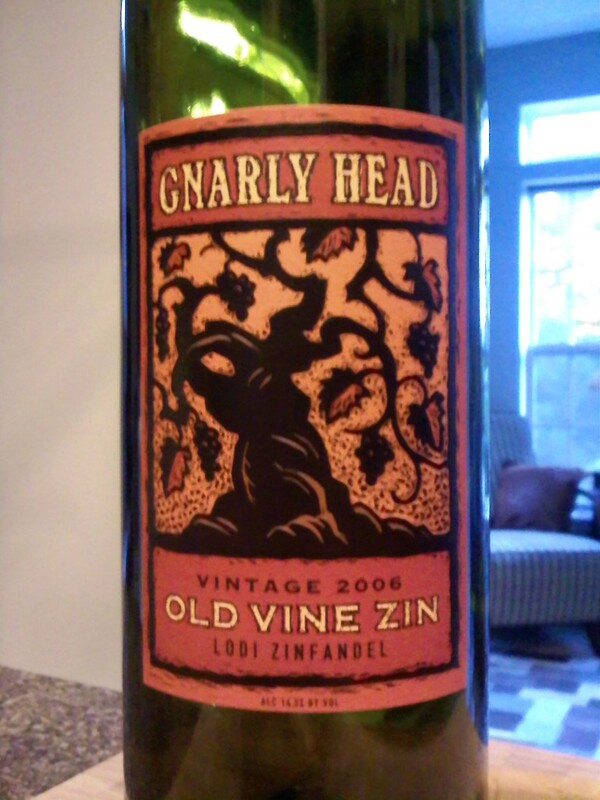 Recommendations: I had seen Gnarly Head on various store shelve and never picked it up, but my wife and I decided on this as we thought a Zinfandel sounded good, and the price was too good to pass on. Aromas of fresh fruit were prevalent on the nose, but not on the palate, where the flavors were subtle, with hints of plum. A pepper finish had just a slight bit of alcohol, a very small bite considering the wine is 14.5% by volume. Paired with a pizza, this was a perfect wine. If you’re looking for something with a bit more pepper you might want to pass on this, but for a nice middle of the road Zinfandel to pair with a simple dinner, you really can’t miss with the Gnarly Head Old Vine Zinfandel – especially for the price. I think a better deal is the Ravenswood Lodi Old Vines Zin 2006 (also reviewed on my blog).